There's a new little "self help" group called, The Clergy Project. The Clergy Project was made possible through a donation from The Richard Dawkins Foundation for Reason and Science. According to their website, "The purpose of The Clergy Project is to provide a safe haven for active and former clergy who do not hold supernatural beliefs." In a June article entitled, Church Pastors Become Atheists, "More than 200 church leaders across the country now say they no longer believe in God, including a Houston-area pastor who was one of the first to publicly announce his decision. Mike Aus, who was pastor at Theophilus church in Katy, made that announcement during an appearance on a Sunday morning show on MSNBC." so near to impossible to leave.” That is the judgment of Richard Dawkins, perhaps the world’s most famous living atheist, as he welcomes unbelieving pastors to join the Clergy Project, a group designed to help unbelieving pastors make their way out of the ministry. Apparently, some are not moving out very fast. Dawkins explains that the Clergy Project “exists to provide a safe haven, a forum where clergy who have lost their faith can meet each other, exchange views, swap problems, counsel each other — for, whatever they may have lost, clergy know how to counsel and comfort.” Dawkins, who once held one of the world’s most coveted academic posts, has now reduced himself to addressing small gatherings of atheists and celebrating a motley crew of pastors who have abandoned the faith — even if some have not abandoned their pulpits. When he found that he could no longer pray for his own parishioners or preach a coherent message, DeWitt resigned, preaching his last sermon in Cut and Shoot, Texas, in April 2011. Now he travels the country organizing Recovering from Religion local chapters and working with the Clergy Project. The magazine also told of Teresa MacBain, once a Methodist preacher in Tallahassee, Fla., and now another trophy of the Clergy Project. The magazine simply states that MacBain “resigned from her pastor’s position in Tallahassee and went public as an atheist.” That is a very strategic example of under-reporting the story. As National Public Radio reported, MacBain first told just about everyone but her church of her atheism. On March 26, 2012, she stood before the American Atheists convention in Bethesda, Maryland and told the 1,500 attendees, “My name is Teresa. I’m a pastor currently serving a Methodist church — at least up to this point — and I am an atheist.” As NPR reported, the crowd hooted and clapped for more than a minute. NPR and The New York Times Magazine attempt to portray MacBain and DeWitt as victims. MacBain presents herself as unnerved by the fact that her church fired her and did not appreciate her declaration of atheism behind their backs at a convention hundreds of miles away. The Clergy Project and similar efforts are rooted in a 2010 study undertaken by Daniel C. Dennett and Linda LaScola of Tufts University. Dennett is one of the major figures in the New Atheism. He argues that belief in God once served an important evolutionary purpose, but does so no longer. Religious belief, he argues, is a vestigial remnant of our evolutionary past that modern humanity must overcome. He is hardly a neutral and dispassionate observer. 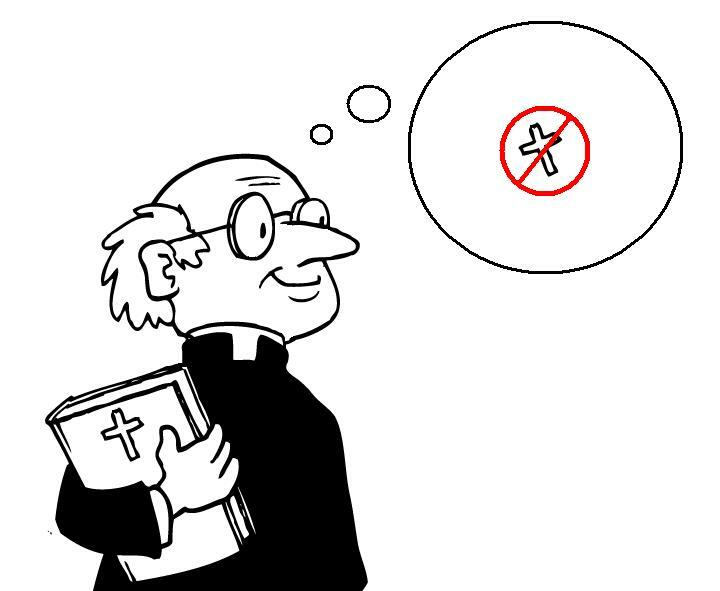 Nevertheless, Dennett and LaScola conducted and published a study known as “Preachers Who Are Unbelievers.” In that study, a small sampling of atheist or unbelieving pastors were considered, along with five representative profiles. These pastors clearly are not believers, at least in any orthodox or recognizably Christian sense. They spoke openly and in considerable detail about their unbelief, with the ministers explaining how they had abandoned any confidence in biblical Christianity. The Clergy Project gets to the point more concisely, defining its membership as “active and former clergy who do not hold supernatural beliefs.” Nevertheless, this definition suffers from the same problem. Many liberal ministers hold to no supernatural beliefs, but they also tenaciously hold to their pulpits without admitting atheism. The Clergy Project is a parable of our times, but it is also a pathetic portrait of the desperation of many atheist and secularist groups. They are thrilled to parade a few trophies of unbelief, but do they really believe that these example are serving their cause? They celebrate a former Pentecostal preacher with no education, who was already a theological liberal when called to his church, and who then educated himself by reading Sagan, Dawkins and Hitchens. Seriously? Ministers struggling honestly with doubts and struggles are in a different category altogether. Doubt will lead to one of two inevitable consequences. Faithful doubt leads to a deeper embrace of the truth, with doubt serving to point us into a deeper knowledge, trust, and understanding of the truth. Pernicious doubt leads to unfaithfulness, unbelief, skepticism, cynicism and despair. Christians — ministers or otherwise — who are struggling with doubt, need to seek help from the faithful, not the faithless.